My passion for Traditional Thai Massage started in 1998, when I received my first treatment, whilst attending a 5 Rhythms Dance retreat at Cortijo Romero in Spain. The massage had such a profound, instant and long lasting effect on me, that I decided I had to train in it. Which is exactly what I did, within months of receiving my first Thai Yoga Massage! Since qualifying as a Thai Yoga Masseur, I no longer use the other forms of massage I’m trained in. None of them come close, to what Thai Yoga Massage offers. I love with a passion, the way a Thai Yoga Massage makes me feel, after I’ve had a treatment! I feel flexible, relaxed, energised, centred and present in my body, but most of all I feel ‘really alive’! And what’s even better, that feeling lasts for weeks…! That’s what impressed me most, about my first Thai Yoga Massage, the way I felt during and after it. I was tired and lethargic, prior to the massage, but during it, I started to feel centred and energised. This feeling started with a tingling sensations, flowing through my body – then, towards the end of the massage, whilst receiving a seated back stretch (applied by the masseur’s feet), I had a massive ‘blocked energy’ release. As I lay back on the matt, I could feel the released energy flowing, freely throughout my body. I was in a state of ecstasy! The after effects, which lasted several weeks. left me feeling so centred, energised, grounded, relaxed and alive, with a joyous engagement with life! I am currently in Chiang Mai Thailand, for three months, studying several different form of Therapeutic Thai Massage. I’m learning all sorts of new techniques, stretches and Asanas (Yoga Postures). I’ve also been studying Ayurvedic Thai Yoga Massage, which fuses elements of both traditions, into a very affective, therapeutic form of Thai Massage. In addition, I also had the opportunity to study with, the supposed ‘Master’ himself – Pichest Boonthumme. Several of the teachers I’ve been studying with, developed their particular style of Thai Massage, through studying with Pichest. So I thought I would follow in their footsteps and go and check him out! Pichest, as everyone calls him, is considered by many Westerners, as the ‘Master’ of Thai Massage. Like all ‘Masters’, Pichest has a reputation! Exactly what that reputation is, depends on who you talk to. Most say he is eccentric, which I would concur with. Some say, he is overly direct. Whilst others accuse him of being darn right rude. I witnessed him, being somewhat unskilful, in the way he spoke and interacted with some people. I even whitnessed him, slap someone on the head! What I found, was a man with a phenomenal amount of knowledge, experience, intuition and wisdom, when it comes to delivering Thai Massage. Some of which, is possibly way to much for some people. Certainly Pichest’s treatments are very advanced and can be very painful – I speak with first hand experience! Pichest’s knowledge, intuition and wisdom, often cuts direct to the chase. I’m guessing that when you’ve reached Pichest’s level of experience, maybe it is frustrating, when his students have difficulty accepting what he’s trying to teach them! Due to their own blocks, getting in the way. 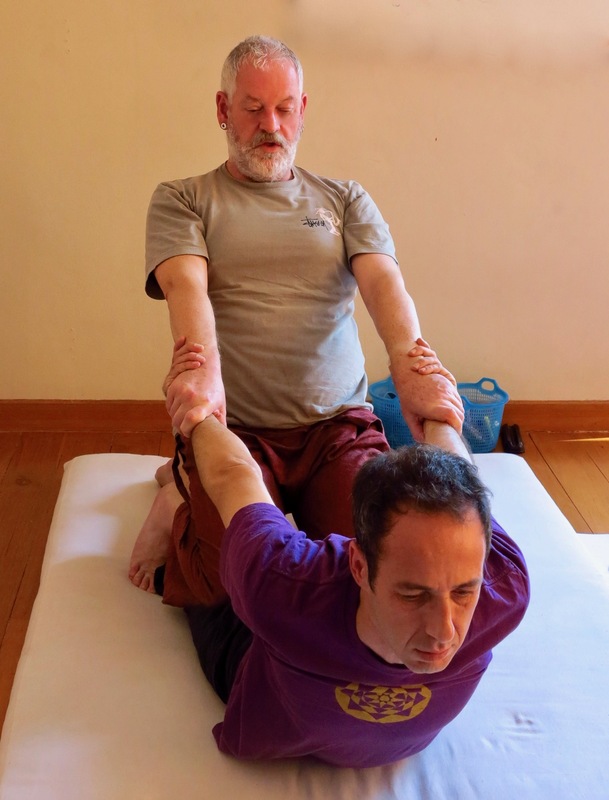 The Master himself – Pichet – demonstrating a hip releasing technique that he used on me. It release a rush of blocked energy. Using Pichest’s words, “There is no precise way of doing anything” “You need to find your own way”. Pichest works through his ‘intuition’ and finds a way that works, best for him and his recipient! Is Pichest’s ‘intuition’ developed to that of a ‘Masters’? He certainly has a ‘highly developed intuition’. Pichest is able to look at a fully clothed person and instantly work out where their energy blocks are, why they are there and in which order the blocked energy, need to be cleared. Pichest’s way of working, through focusing on the cause of the blocked energy, apposed to the end result, of the blocked energy, allows for all blocks to clear at the same time. On my first visit to Pichest, he asked me to lie on his mat, so he could work on me! He performed the same hip opening technique, pictured above and in the videos above and below – It was an amazing experience and even more profound than my first experience, of blocked energy being release from my body, back in 1998. By the time Pichest had finished demonstrating his technique on me, all I could feel, was energy flowing freely though my body and out of my foot. The real impact of Pichest’s work, finally hit me some hours later. When I was walking home. I couldn’t help but notice, how amazing I was feeling, so centred, so free in my body and so energised and alive. That feeling still remained with me, over three weeks later! All in all, I found Pichest to be very eccentric! Is that what a ‘Master’ is meant to be? Pichest certainly has an infectious passion for Thai Massage, which he’s probably practiced, most of his life! I’m certainly glad I attended his school. Which I found really interesting. Especially as I was lucky enough to get a ‘hands on’ experience of his work, whilst also seeing him work on others. But is he the ‘master’ of Thai massage? I’m not so sure! Thai people don’t study with Pichest, only Westerners. So I wonder, if over the years, it’s Westerners who have elevated Pichest to the level of ‘Master’ – through their own need to revere and follow one! Ironically Pichest constantly talks about the “Ego” and the need to let go of it. Yet I fear, through individual’s need to follow and revere a ‘Master’, the “Ego” is exactly what they have not let go of! Many of them have the need, to tell their friends and colleagues, they’ve studied with the ‘Master’! Personally I think there are other teachers, who I’ve worked with, who equal and transcend Pichest’s abilities. They teach with far more compassion than Pichest, they do’t have his eccentricities, rudeness and borderline bullying ways of working. Which I’ve heard about and witnessed first hand. I think Pichest is quite possibly, the best Thai Massage practitioner, but for me, he is not the ‘Master’ or the best teacher! Traditional Thai Massage is mainly practiced in the south of Thailand, whilst the northern style of Thai Massage, includes gentle stretches and Yoga Asanas (postures). Therefore, northern Thai Massage, is often referred to as Thai Yoga Massage. In addition, there is also Therapeutic Thai Massage, which many of Thailand’s hospitals offer as a form of Medical Therapeutic treatment, in the same way our western hospitals might offer Physiotherapy. Though Medical Therapeutic Thai Massage is much more effective! 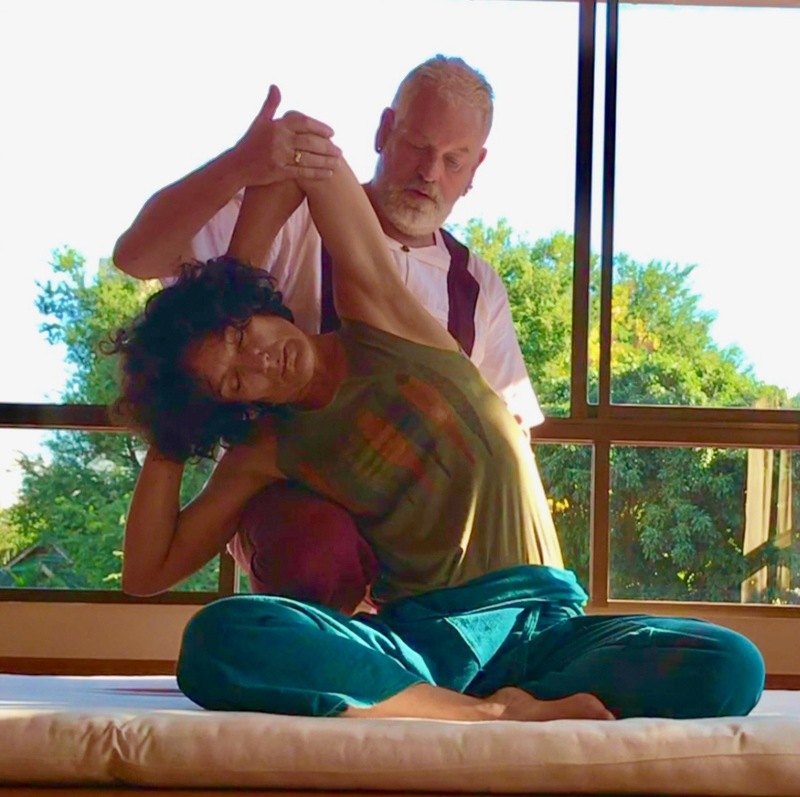 As time goes on, Thai Massage techniques will continue to develop and grow, as more practitioners create new techniques, styles and ways of working with Thai Yoga Massage. I for one, am loving all the new developments. They elevate Thai Yoga Massage onto a completely new level, where the Therapeutic aspect really comes to the fore. Instead of Thai Yoga Massage just being about the beneficial and powerful release and rebalancing of blocked energy, which in turn, allows the body to fulfil it’s natural ability to self-heal. Ayurveda Thai Yoga Massage, is a form of massage that combines balancing the Ayurveda Elements and Doshas, with a specific chosen set of advanced Thai Yoga Massage stretches and Asanas. The Ayurveda diagnosis system, allows the Thai Yoga Masseur to determine, which stretches and Yoga Asanas and what type of energy release work, is most needed, to help rebalance the Elements and Doshas. Ayurveda Thai Yoga Massage brings, the therapeutic aspect of a treatment, to the fore. Ayurveda comes from the premis – we are all made up of a combination of 5 basic Elements:- Space, Air, Fire, Water and Earth. According to Ayurveda, the Elements combine together, to work as 3 forces in our body. We each have these 3 forces (also called Doshas) in our bodies, in different quantities, Our rhythm, our likes and dislikes, our tendencies are all influenced by those Doshas. Ayurveda shows you your personal combination of these Doshas and offers guidance on everything, from what style of massage to receive:- foods to eat and even lifestyle practices that help to regulate an optimal balance of these Doshas, in your body. The general maintenance becomes the path to living a healthy life. Yoga and Thai Massage go hand in hand, but they can also be separated. Instead of doing a Thai Yoga Massage with applied stretches and Yoga Asanas, it is possible to leave out the ‘blocked energy’ element of the Thai Yoga Massage and instead, only focus on the stretches and Yoga Asanas. Applied Yoga Asana Massage is a brilliant treatment, specifically developed for Yoga Practitioners and Yoga Teachers, who want to further their Yoga practice. Applied Yoga Asana Massage uses a system that helps you better achieve a set of 12 established stretches and Yoga Asanas. Through having the stretches and Yoga Asanas applied to your body, the Yoga Practitioner is able to achieve greater flexibility, which in tern, allows you to go much deeper into each Yoga Asana and achieve markedly improved results. After only a few Applied Yoga Asana Massage treatments, it is possible to achieve the same results on your own. These new styles of Thai Yoga Massage, certainly open up the therapeutic side of Thai Massage. They allow Masseurs and Bodyworkers to offer specialised treatments, which address the specific issues and needs of each individual. Whether that need is, a relaxing and energising massage, a whole system rebalancing, or a cathartic, therapeutic release. If you’d like to experience, first hand, any of the styles of Thai Yoga Massage, mentioned in my blog, please go to the specific Thai Yoga Massage – Therapeutic Thai Massage – Ayurveda Thai Yoga Massage – Applied Yoga Asana Massage page of my website. Alternatively use my contact me form, to ask for more information, to ask a specific question, to book a treatment, or to enquire about my Thai Yoga Massage Courses. ← Do you have a ‘chosen adult name’? Why mine is Hagbard!